By choosing custom furniture it allows you to choose a basic frame style and customize it to your particular taste. Palm Beach Fabrics carries a custom furniture line made entirely in the United States. You can select from a wide variety of available pieces such as sofas, sleepers, love seats, chairs, swivel gliders and ottomans. For example you select the frame style of sofa then also select how many seat and back cushions you prefer, the style of the cushions and whether you want it slipcovered or upholstered. Each style of sofa has an array of matching furniture pieces such as chairs, chaises, love seats, ottomans, etc. Sleepers are also available in many sizes ranging from queen sleeper sofas to single sleeper chairs. One the best features of our custom furniture line is being able to customize a sectional to fit your individual space. There are almost endless possibilities in configuring your sectional to fit any room. You can mix pieces such as chaises, sleepers, corner wedges as well as armless pieces to get just the look and size you want. Upholstery Fabric for your custom pieces can be chosen from the furniture company’s wide selection or you can choose any designer fabric available through Palm Beach Fabrics. We have thousands of choices both in stock and to order that will satisfy all tastes. Furniture pieces are available slipcovered or upholstered in your fabric selection. Our custom furniture line is unique in that all pieces are available slipcovered. 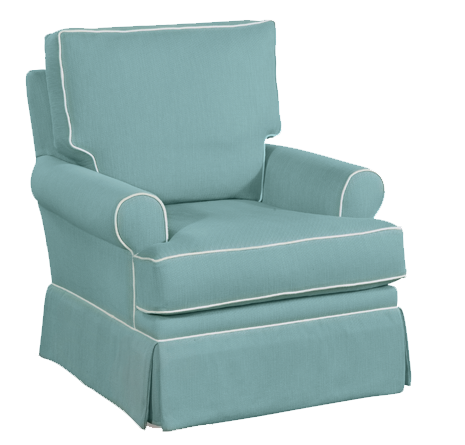 Slipcovers have been very popular due to their casual “coastal” look and ease of cleanability. Our line’s slipcovers are also ingeniously made. Each piece of the slipcover can be individually removed making cleaning a breeze! You can just remove and clean the soiled sections without having to remove the entire slipcover. West Palm Beach, Jupiter, Lake Worth, Loxahatchee, North Palm Beach, Palm Beach, Palm Beach Gardens, Stuart, Hobe Sound and Wellington.